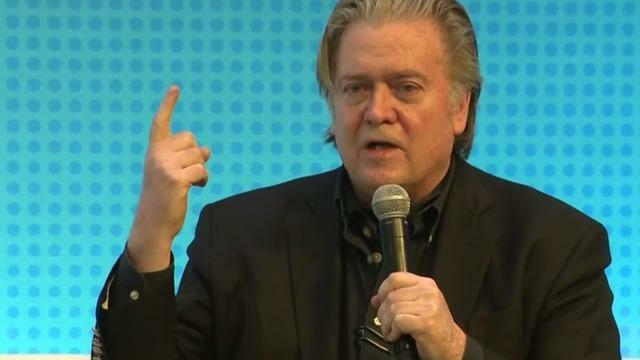 A Virginia bookstore owner called the police on a woman who was yelling at former White House strategist Steve Bannon inside his establishment over the weekend, the Richmond Times-Dispatch reports. Bannon joins a growing list of Trump associates or staffers who have been confronted in public. Nick Cooke, owner of Black Swan Books in Richmond, told the Virginia newspaper that Bannon was browsing inside his store when a woman called him a "piece of trash." Cooke called 911, but the woman left as he made that call. "Steve Bannon was simply standing, looking at books, minding his own business," Cooke said. "I asked her to leave, and she wouldn't. And I said, 'I'm going to call the police if you don't.' And I went to call the police and she left. And that's the end of the story." Richmond police confirmed a call was made Saturday afternoon of someone yelling at a political figure in the bookstore, adding the call was canceled before officers could respond, according to the Times-Dispatch. CBS News reached out to Cooke for further comment, but did not immediately hear back. Recently, officials connected with President Trump have been facing confrontations from concerned citizens. White House press secretary Sarah Sanders was asked to leave a Virginia restaurant by its owner, citing her work for President Trump. Former Environmental Protection Agency administrator Scott Pruitt was challenged by a woman holding her 2-year-old son in a Washington, D.C., restaurant last week. In June, protesters yelled at Homeland Security Secretary Kirstjen Nielsen inside a Mexican restaurant as the Trump administration was reeling from criticism over its family separation policy at the border. Secretary of Transportation Elaine Chao and her husband, Senate Majority Leader Mitch McConnell, were also confronted for the same policy in Georgetown.